Discussion in 'Coop & Run - Design, Construction, & Maintenance' started by RendonRoo, Jun 28, 2009. This is my homemade feeder pics. These work great, take up no floor space, and waste no feed. Instructions. Cut a 3' piece of 3" pvc pipe. I recommend schedule 40. 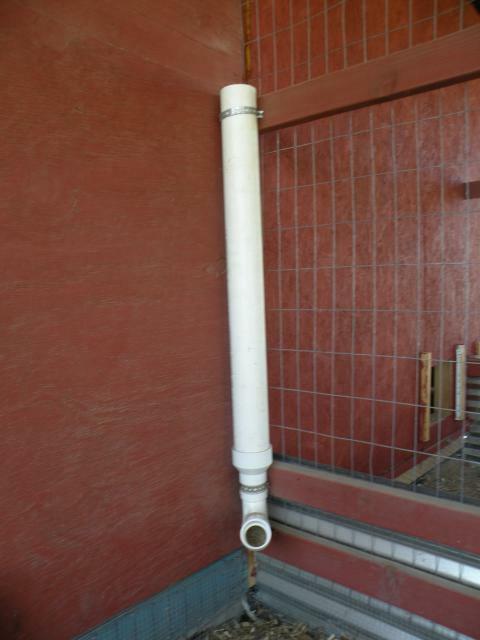 Place a 3" x 2" Reducer on the bottom of the pipe. Mine has a 4" piece of 2" pvc next. You can eleminate this with a 2" street 90 degree elbow. Insert the small side of the 2" elbow into the bottom of the reducer. Now using a 2" 45 degree street elbow put the small side of the 45 into the bottom of the 90. Now just hang it on the wall and fill it. Caution. If the feeder is empty you need to cover the bottom so the feed won't just run thru. Once the elbows are full it will not fall out. If you place your feeder where it could get wet you will want to put a 3" cap on top to keep feed dry. Be sure to hang the feeder about back high to the chickens so they can reach in to eat but they can't bill it out on the ground. There is no need to glue the fittings together as they will stay put. This makes it easier to disassemble for cleaning. If your feeder is in a lot of direct sunlight you will need to paint it. Spray paint is good enough. This will keep the uv rays from breaking down the pvc. Hope this makes it simple for you. I'm gonna try to make a video from start to finish soon. If you have any question feel free to e-mail me. I'm putting one of these together TODAY!!! Thanks!!!!!!!!!! Do you have any problem with feed spilling? Do you feed pellets or mash? You can also make them with 2" pipe for smaller flocks. I'm using two of them for my 2-5 chicken coops. I can't say enough about these feeders. I was worried about them fighting over who got to eat but they share, two at a time, and the others patiently wait their turn. Good Luck and i hope you all enjoy these as much as i do. Thank you! You answered my question about number of chickens feeding out of it too. I feed crumbles at all age and have no spillage except what i spill filling them. I forgot to mention i use an automotive funnel to fill. The 3" feeder will hold about 2 of the large coffee cans and it last about 3-5 days depending on heat and amount of treats and bugs they get. I'm glad you all like my idea and hope it serves you as well as it does me. I like the PVC feeders and they work great on chicken tractors too. I put the pipe on the outside and the elbows inside. Feed stays dry and easy to fill.